This July, we mark the 80th birthday of PeaceHealth Sacred Heart Medical Center in downtown Eugene. It was on a warm afternoon in 1936 that four Sisters of St. Joseph of Peace arrived by train with a mandate to take on management of the financially struggling Pacific Christian Hospital. Persuaded by local physicians and a community eager to see it survive, the Sisters officially purchased the hospital from the Pacific Hospital Society on July 1, 1936 for $50,000. The Sisters arrived five days after the sale was final and immediately began the work of making a failing hospital succeed. They renamed it Sacred Heart General Hospital, and within five years had built a six-story addition with 100 more beds, expanding surgical and ancillary medical services for their growing community. In the years that followed, the campus would continue to grow and bring many innovations and “firsts” to Lane County. The Sacred Heart School of Nursing was established in 1942 and trained more than 600 nurses before Lane Community College took on the program in 1970. In 1981, we started the first adolescent alcoholism treatment program in Oregon: the Sacred Heart Adolescent Recovery Program (SHARP). And in 1969, the R.O. Johnson Unit was completed, providing much-needed inpatient psychiatric beds and related outpatient services. The establishment of a Neonatal Intensive Care Unit in 1977 provided highly specialized services to premature babies, which had a significant impact in lowering the infant mortality rate in Lane County. Sacred Heart also started the first hospice care in Eugene-Springfield, beginning the service in 1984. As the hospital grew and evolved, so, too, did the city around it. The day the four Sisters disembarked from their train in 1936, the population of Eugene was approximately 20,800. Today, Eugene is a city of more than 159,000. In 2008, PeaceHealth added a second campus: PeaceHealth Sacred Heart Medical Center at RiverBend. This addition brought the total number of beds to 442, and allowed PeaceHealth to serve more than 30,000 patients per year. Sacred Heart University District in Eugene remains a dedicated community medical facility. On this historic site, we continue our work to serve the community with 104 beds, a 24-hour Emergency Department, a 35-bed inpatient behavioral health services unit, and a range of primary and specialized care services. 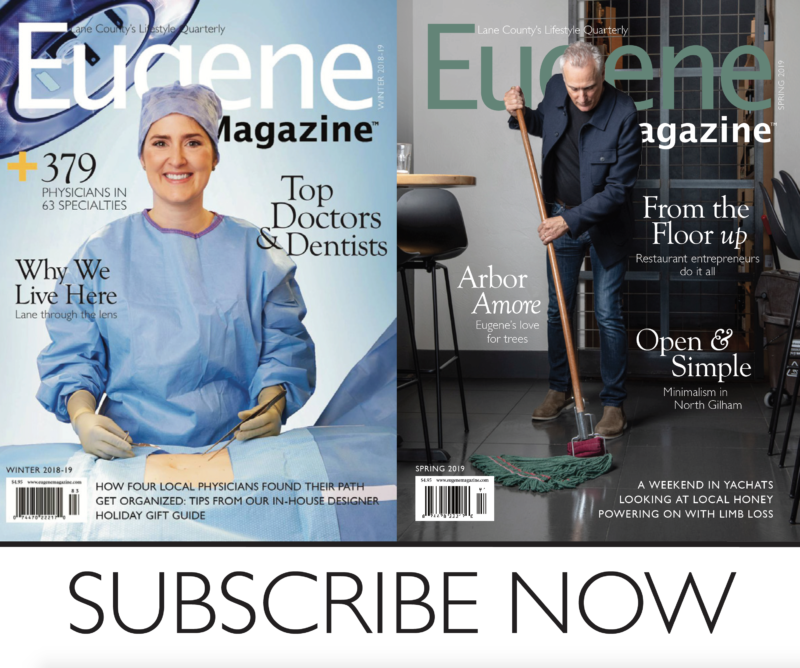 The future of health care in Lane County will be shaped by the same trends and changes buffeting health care systems across the country: primary care shortages, an aging baby boomer population, the Affordable Care Act, and advances in medical technology. Our plans to meet these challenges include comprehensive provider recruitment, collaboration on medical student mentorships, growth of our preventative and long-term wellness programs, and the addition of new services to our downtown campus. PeaceHealth is proud to be a partner with Northwest Christian University’s RN-to-BSN program, which continues our tradition of nurse education by helping nurses earn their Bachelor of Science in nursing. We began this journey 125 years ago when the Sisters of St. Joseph of Peace sent two young Sisters to the untamed wilderness of Bellingham, Washington. Their Mission was simply to serve—to attend to the needs of the local pioneer families. It was in this spirit of service that PeaceHealth came to Eugene and grew into a regional health care provider with hospitals and clinics in Springfield, Cottage Grove, Florence, and points in between. We look forward to the years ahead as we continue to grow and serve the community where the story of PeaceHealth in Oregon began. Mary Anne McMurren is Chief Administrative Officer, PeaceHealth Sacred Heart Medical Center, University District.